The title of Vicky’s story is “Your dreams are within your reach” where she talks about how commitment, following a lifestyle akin to nomadism, is no easy feat. The title of Vicky’s story is “Your dreams are within your reach” where she talks about how commitment, following a lifestyle akin to nomadism, is no easy feat. But Vicky Etherington had to take it in her stride when she married a soldier who was regularly posted to various locations all over the world. Dealing with death scares, secret missions and constant change, Vicky led the kind of life known to us only in cinema stories about love, war, trials, loss and victory. Faced with a medical condition herself eventually, Vicky was forced to make radical decisions about her life and business. A pioneer in the digital world, Vicky set up her online marketing agency in 2003. She teaches coaches and therapists how to create their own client-attracting websites, rise above the noise, thrive at entrepreneurship, master technology with confidence and grow their businesses successfully. With a bigger vision of working with entrepreneurial women in the rural areas of Africa to help communities break the cycle of poverty, Vicky is passionate about helping entrepreneurs closer to home as well, and loves to see coaches, therapists and change-makers conquer their fears, drive their businesses forwards with confidence and realise their dreams. – Using one’s challenges to live a more fulfilled and balanced life. 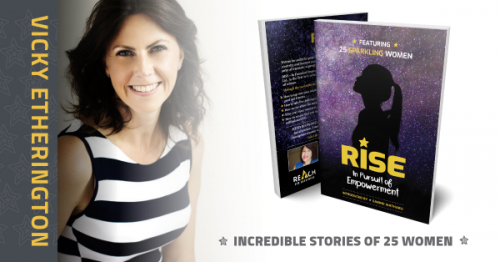 Read Vicky’s story and many other inspiring stories by investing in RISE – In Pursuit of Empowerment.